Cristiano Ronaldo has been given a five-match ban following his red card in Real Madrid's Spanish Super Cup first leg 3-1 win over Barcelona. The Portugal international was ordered off after picking up two yellow cards, one for taking his shirt off after putting Real 2-1 ahead with 10 minutes remaining, and a second for diving after referee Ricardo De Burgos Bengoetxea ruled that he had tried to win a penalty when challenged by Samuel Umtiti. 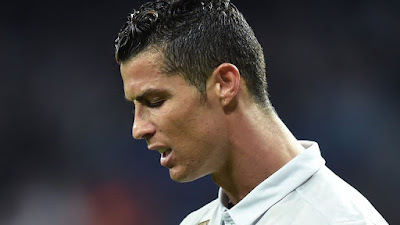 However, Ronaldo reacted angrily and appeared to push Bengoetxea after receiving his second yellow card just two minutes after scoring and picking up his first caution, and the Spanish football federation (RFEF) has now handed Ronaldo a five-match ban - one for the double booking and another four for pushing the official. Pending an appeal, the 32-year-old's ban will start with the Super Cup second leg against Barcelona on Wednesday, live on Sky Sports. He will then miss La Liga fixtures away at Deportivo, at home to Valencia and Levante and then away at Real Sociedad. Real boss Zinedine Zidane branded Ronaldo's second yellow card as "ludicrous". He said: "I'm annoyed that Cristiano Ronaldo was sent off, it might not have been a penalty, but still, giving him a card is ludicrous. "Let's see if we can make arrangements for him to be available on Wednesday. I am truly proud of my players, they played well as 10 and really wanted the win. Now we turn our attentions to the return leg and we need to relax." Real Madrid went on to win the game 3-1 thanks to Marco Asensio's late strike.